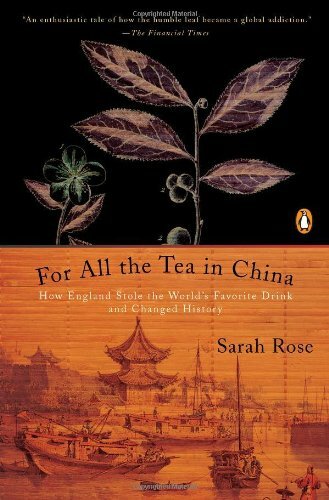 On our 5200-mile road trip last month, I listened to the audio version of the book For All the Tea in China: How England Stole the World’s Favorite Drink and Changed History by Sarah Rose. In the dramatic story of one of the greatest acts of corporate espionage ever committed, Sarah Rose recounts the fascinating, unlikely circumstances surrounding a turning point in economic history. By the middle of the nineteenth century, the British East India Company faced the loss of its monopoly on the fantastically lucrative tea trade with China, forcing it to make the drastic decision of sending Scottish Botanist Robert Fortune to steal the crop from deep within China and bring it back to the British plantations in India. Fortune’s danger-filled odyssey, magnificently recounted here, reads like adventure fiction, revealing a long-forgotten chapter of the past and the wondrous origins of a seemingly ordinary beverage. The book is a treasure trove of historical information about China in the mid-1800s, as well as all things related to tea. Occasionally, there are cultural gems to be mined. In chapter 5 Rose describes an incident that took place in Hangzhou between Fortune and his servant, Want. Having failed to follow Fortune’s instructions, they find themselves in the city of Hangzhou, where if it is discovered that Fortune is a foreigner and not a Chinese official (he was disguised as one), he could be killed. So he gives the servant a public scolding. In the course of describing this incident, Rose (perhaps inadvertently) gives one of the best descriptions of the Chinese notion of “face” that I have found anywhere! But Fortune’s recriminations had little effect, for a master’s scolding his servants publicly only served to build their self-esteem, or “face,” as even a reproach was a tacit declaration that the servant was important enough to merit the notice of a wealthy mandarin. In China “face,” or mianxi [sic] was a concept that a Westerner like Fortune did not instinctively understand, describing as it does the prestige and reputation one gains from every human interaction. Relationships in China were defined by the reciprocal obligations between people, whether of the same or a different status, and every individual existed within a network of influence, a matrix of duties and social connections, or guanxi. The family came first, then the extended social neighborhood. “Face” expressed a person’s position within his or her network and was the mechanism by which the Chinese assessed their obligations: which orders to obey, which favors to grant, and which supplications and apologies to make. A son might perform humble acts for his father, or an employee might bow before his master or a student before his teacher, but in turn the father would have a set of defined responsibilities to the child, the master to the slave, and the teacher to the student. However subtly they were expressed, mianzi and guanxi were inescapable facts of life in China; then as now they forged the social fabric of the nation. Social connections determined the measure of justice received and discrimination suffered. While no Chinese person was free from these relationships, many peasants had very little face and therefore little access to justice, wealth, or freedom. When social obligations were met, someone gained face and an increase in status; when a person failed those to whom he was socially connected and thereby obligated, he suffered loss of face (diumian) and a downturn in his social standing. When Wang was shouted at by Fortune for failing to follow orders, it demonstrated to the world that he had responsibilities to an important man. Wang lost face with Fortune, while simultaneously gaining it in the wider neighborhood of Hangzhou. Face was a very Confucian concept. The great philosopher, whose ideas gained influence during the Han Dynasty, 206 BC-AD 220, described a world where familial connections and obligations to ancestors were the highest good and the greatest aim of an individual. A single person was nothing if he did not bring honor to the world from which he came. So, did Fortune understand that by giving this public dressing-down after being exposed as foreigner, that he was he engaging in not-so subtle transcultural theater? Behaving in a way that mimicked what he had seen other mandarin’s do, thereby signaling that while a foreigner he understood on some level how things should looked and worked culturally? Hence creating some connection with his Asian audience and in the process saving his own hide? If he dresses, speaks and acts like a mandarin, well… While we’re on it, was Lawrence of Arabia influenced by Robert Fortune? And switching gears abit – last year I was in Northern Thailand in the area Chiang Rai in the Golden Triangle. We visited an excellent museum while there: The Hall of Opium. All aspects of opium were addressed in some way. Its cultivation, medicinal use, illicit trade, addiction, etc.. What I learned was that you couldn’t consider opium without considering tea, as a good amount of space in the museum was dedicated to the relationship between tea and opium. Ying and Yang, one balanced the other trade-wise for a long time as the British confirmed with their forced feeding of opium into China to bring their tea-induced deficit to China into balance. “A single person was nothing if he did not bring honor to the world from which he came.” Something to remember! Thanks for sharing! Yes, and it explains so much, even about modern China.